We have just launched a beautiful set of 16 infographics, each explaining one of the key human rights protected by law. 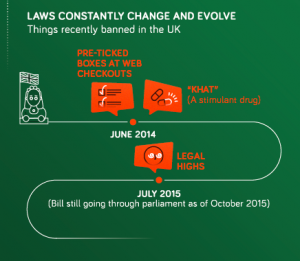 You can see them all here and the Article 7 infographic here. Article 7 of the ECHR is about the “principle of legality”, sometimes expressed as ‘no punishment without law.’ It’s one of the lesser known rights, but it fundamental. It means the state can’t punish you for an act unless it was illegal at the time you did it. And you can’t get a harsher penalty for doing a crime than the one in force at the time the original crime was done. This principle has been part of the English common law for centuries. The English philosopher, Thomas Hobbes summed it up in 1651; “No law, made after a fact done, can make it a crime.” This principle has been followed in historic legal codes, influencing the development of the US Constitution and the Universal Declaration of Human Rights. Article 7 is needed in any legal system, especially given how often laws change and evolve. For example, between 2012-2014 in England and Wales , 607 new criminal offences were created, and 353 criminal offences were repealed. Another important requirement Under Article 7 is that criminal offences must be clearly defined in law. If the laws are vague, they can’t be applied effectively. After all, how can we choose the right actions if we can’t know whether they will be criminal or not? Article 7 has one key exception, which is that people can still be prosecuted for war crimes committed in the past, even if those crimes were not part of the criminal code at the time the acts were done. This part was included in response to the atrocities done by Nazis in World War II, who were ultimately prosecuted at the Nuremberg war trials. Because of this exception, dictators can’t get away with committing crimes against humanity just because their domestic laws allow them to do so. Compared to other parts of the ECHR, breaches of Article 7 have been rare. Between 1959-2014, there were 39 breaches of Article 7, and the UK was found to have breached Article 7 only once.